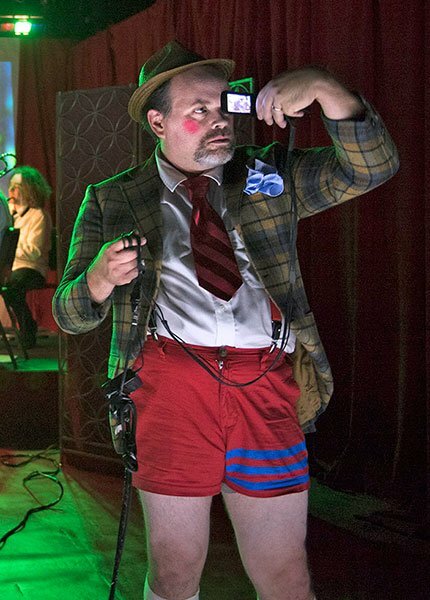 Over a decade, the offbeat Guerilla Opera Company has been presenting various somethings “wild and woolly.” That continued to be the case in the chamber opera Loose, Wet, Perforated, “A morality play in four ordeals,” with libretto and music by Nicholas Vines, in its second production by the company, after a gap of several years. This weekend it was directed by Austin Regan, who conceived the “ordeals” which the characters are made to undergo in search of wholeness as sets and actions borrowed from television game and reality shows, where the presence of “morality” is sketchy at best. The opera’s single act runs for about an hour and a half, ending, like a turn of the great wheel of fortune, with the preamble starting to play all over again—but with one notable difference: Each of the characters has moved along as if in a game of musical chairs (musical opera roles?) to the next part down the line. The circle of life, of fate, of whatever, keeps rolling. One surprise came on our learning that the opera’s title actually consists of the names of the three principal characters, who are therefore named according to some (bizarre?) quality, not unlike in the traditions of Medieval morality plays, such as Everyman, peopled by Good Deeds. Beauty, Strength, Discretion and Five Wits. To be sure, Loose, Wet, and Perforated doesn’t suggest any particular moral characteristics, but then, perhaps that constitutes its basic irony. If ever there were an opera whose performers went all in for their roles, acting some of the most bizarre plot turns, this was it. The four excellent voices fully to projected their personalities and characters. Soprano Aliana de la Guardia played Loose, baritone Brian Church was Wet, countertenor Douglas Dodson got Perforated, and mezzo-soprano Thea Lobo, as Various, participated in ever-changing parts, including Grand Master, Baker’s Wife, Milkmaid, Emma of Normandy, and a Local Tartlet. Unfortunately, the four-piece orchestra often made hearing the clever and sometimes confounding words of the libretto very difficult. Even if not played too loudly, a score for wind instruments with no strings almost guarantees covering the consonants with which singers actually project the text. Stringed instruments can play more quietly (though the winds here could certainly keep the volume down when required); but the strings are also fundamentally different acoustically, so that the voices can penetrate. Winds are acoustically more like singers, and the one tends to override the other. One result was that, though I was fascinated from beginning to end by the comic, droll, or weird actions of the performers, I all too often had only a slight sense of what the actual point was. Only on my way out of the theater at the end did I learn that the libretto had been posted online. I downloaded and read it when I got home—and wished mightily that I had done so before going to the performance. Still, I have to give all honor to the four instrumentalists, who played almost non-stop for the full length of the opera, with no conductor and with a score that tended to avoid regular metrical gestures that would help them stay together. Amy Advocat (clarinets), Philipp A. Staudlin (saxophones), Chirs Moore (trombone), and Mike Williams (percussion) kept a chamber-music togetherness throughout. Of course they at least had vocal cues to stay together. The singers were facing away from them almost the entire time, and they, with no conductor or obvious aural beat patterns, managed to make their entrances with consistent accuracy, as far as I could tell. 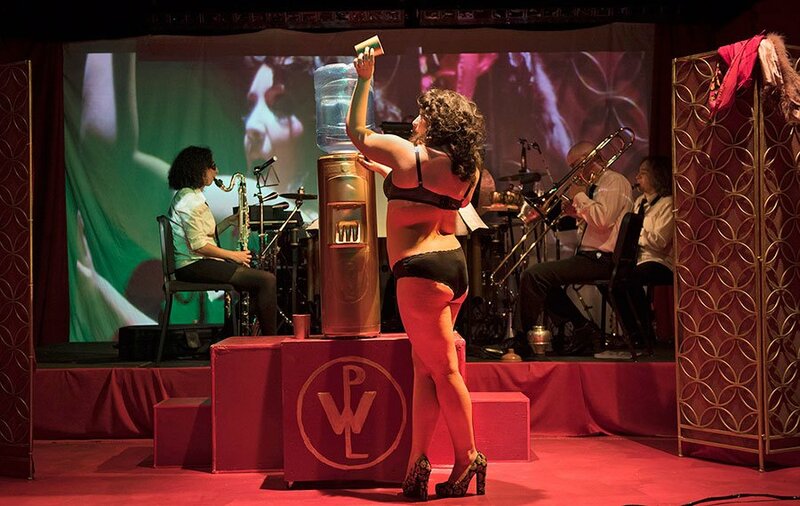 Additional staff included Julia Noulin-Mérat as staging designer, Keithlyn Parkman as lighting designer, and Neil Fortin as costume designer. The tiny Zack Box Theater in the bowels of the main Boston Conservatory building at 8 The Fenway housed a smooth and effective production. Hardly a thing of lyric tunes, Loose, Wet, Perforated, quite possibly would reveal more of its secrets in further hearings after reading the libretto closely. But as a theater piece, it “went,” holding our attention throughout.